Want it by Wednesday 24th April? Order within 4 days, 21 hours, 23 minutes and choose Next Working Day - Kerbside Delivery (Order Must be Placed by 2pm) at checkout. Our Timeless Engineered 18/5mm Brushed and Lacquered Oak flooring could be the focal point in your home for years to come. 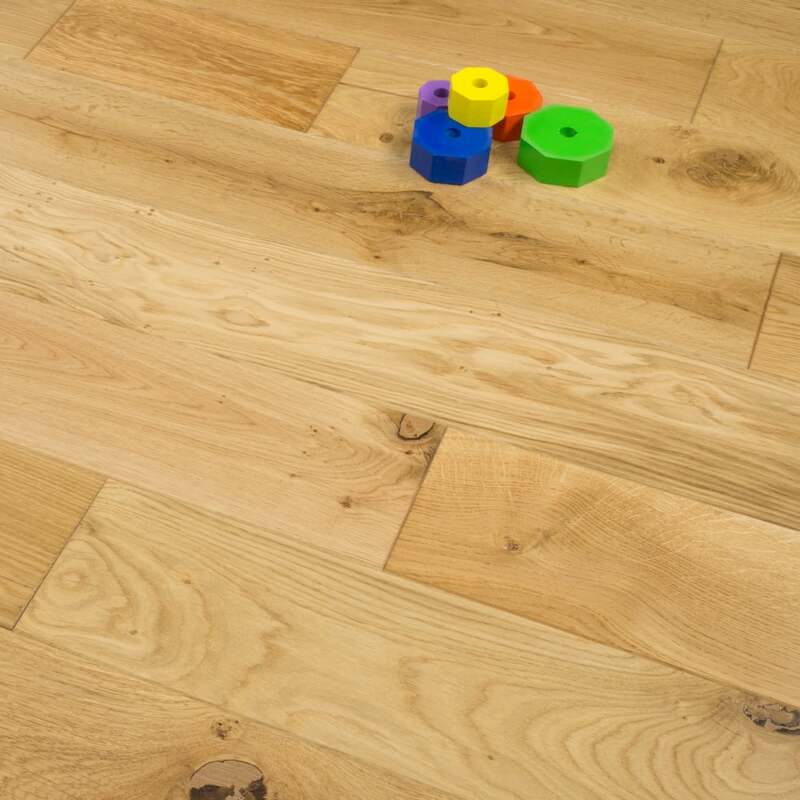 At 18mm thick with a 5mm Oak Veneer wear layer this is a high quality engineered floor that will last, and with 150mm wide boards you can lay this floor in any size of a room without worrying that the floor will emphasise the space in a negative way. During manufacture, the boards are treated with a steel comb which really brings out the natural grain of the floor, adding more rustic charm and beauty that a smooth wooden veneer. The Lacquered finish means that this floor will be less susceptible to water damage from above, and could therefore last even longer in your home. The Lacquered finish also give the floor a slight sheen, making it look more expensive and opulent. All 4 sides of each plank have a milled bevelled edge which defines both the width and random length of each plank across your elegant floor. Love our floor? Make it yours! The finish on the flooring is good, a nice blend of natural looking texture and hard-wearing varnish. The biggest issue with the boards is the tongue and groove don't click together which makes fitting using just glue more tricky as you have to keep watching all the boards to ensure gaps don't open up as your fitting. In think using secret nail would be a more appropriate fitting method. In terms of damaged boards we only found 3 boards out of 76m2 that had a finish edge that was out of square and couldn't be used. The clients are very pleased with the overall look of the new flooring. This flooring looks amazing beautiful quality and looks so expensive love the scrapped effect so natural looking.